The manufacturing expansions, mergers, and acquisitions by state in the last 30 days. 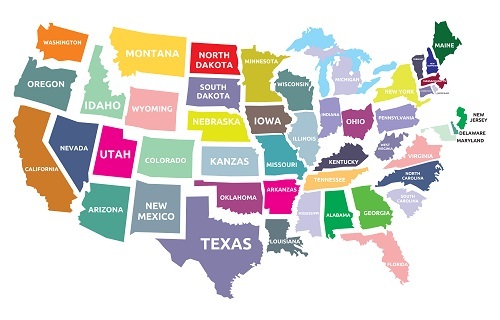 Don't see your state? Send your expansion, merger, and acquisition news to editor@mfrtech.com to be included in next month's round-up. Blue Dot Safes, a U.S.-based custom safe manufacturer and service provider, will locate a new distribution and call center in Lake County, creating 28 new jobs in Indiana. The California-based company is investing $1.25 million to purchase, update and equip a 60,000-square-foot facility at 430 Russell St. in Hammond. The new facility, which is the company’s second location, will be home to Blue Dot Safes’ 24/7, in-bound call center and will also serve as its distribution and fulfillment hub in the Midwest, shipping custom commercial and gun safes across the country. SIMCO of Southern Indiana, a startup company focused on manufacturing reflective bubble insulation products, will build a new facility in Crawford County, creating 10 jobs by 2021. SIMCO will construct and equip a 12,000-square-foot facility at the Crawford County Industrial Park, located off of Interstate 64, at 6225 E. Industrial Lane in Leavenworth. Scheduled to be fully operational by December 2018, SIMCO will make reflective bubble insulation products, which are used in the construction of post-frame, pole and metal buildings. Nippon Steel & Sumikin Cold Heading Wire Indiana Inc. opened its new 150,000-square-foot cold heading steel wire plant is Shelbyville. Lehigh Hanson Inc., a supplier of cement, concrete and related building materials, announced plans to expand its operations in Mitchell, investing more than $600 million in its Lehigh Cement Company plant and creating up to 52 new jobs by 2022. Oji Intertech Inc., a Japan-owned automotive and industrial parts manufacturer, will expand its operations in Wabash County, creating up to 33 new jobs by 2021. The company, which is a subsidiary of Tokyo-headquartered Oji Interpack Co. Ltd, will invest $4.5 million to double its 80,000-square-foot plant at 906 W. Hanley Road in North Manchester, adding another 80,000 square feet to support its quickly-growing U.S. client base. EnCom Polymers Inc., a compounder of high performance polymers for multiple industries, announced plans to expand its headquarters in Evansville, creating up to 56 new jobs by 2021. Festool recently announced that the headquarters for Festool USA and Festool Canada, located in Lebanon, Ind., will expand by 80,000 square feet. Company executives cite increased demand behind $9.3 million expansion, as the Festool brand continues to grow among professional tool users, residential contractors, painters, remodelers, and woodworkers. Construction is scheduled to begin in November 2018 and will be completed by December 2019. Niagara Bottling LLC, a U.S. private-label bottled water manufacturer, announced plans to expand its operations in Indiana, establishing a new facility in Jeffersonville and growing its current facility in Plainfield, creating up to 57 new jobs by the end of 2019. South Korea’s DAE-IL Corp. broke ground for the company’s $50 million, 120-job automotive parts plant in West Kentucky. Company leaders expect the 295,000 square-foot plant, being built in the Murray-West Industrial Park, to open in May 2019. Employees at the new facility will manufacture automotive transmission gears. Plastic bottle and packaging manufacturer Alpla Inc. will grow its Bowling Green facility with a $6.9 million project expected create 24 full-time jobs. Loc Performance Products, Inc. is expanding into the Lansing market, creating up to 700 new jobs. Loc is a manufacturer of large CNC machined components, fabricated structures, and assemblies for military and industrial applications. Grand Rapids-based Burke Porter Group, a global supplier of intelligent testing, instrumentation and assembly systems and solutions, today announced its acquisition of Galileo TP Process Equipment S.r.l. (Galileo), which is headquartered in Florence, Italy. Carolina Color Corporation has acquired Chroma Corporation, based in McHenry, Illinois. Chroma Corporation is a specialty color and additive concentrate business serving packaging, electronics, and many other markets. The Timken Company, a leader in engineered bearings and power transmission products, has reached an agreement to acquire Cone Drive, a manufacturer in precision drives used in diverse markets including solar, automation, aerial platforms, and food and beverage. Cone Drive sales are expected to be slightly above $100 million for the full year 2018. BMT plans to locate new operations in Jellico and expand its current operations in Jacksboro, investing a total of $3.7 million and creating 148 new jobs in Campbell County. BMT manufactures various trailers for short bed, motorcycle, utility and cargo trailers. The company has been in operation since 2016 and currently employs 31 people at its location in Jacksboro. A.Y. McDonald Manufacturing Co. broke ground on an expansion in Elizabethton. The company is investing $8 million to double the size of its operations in Carter County. In the process, the maker of utility products plans to create 36 new jobs. A.Y. McDonald currently employs more than 140 people at its Elizabethton facility. Fortune 500 company Oshkosh Corporation will establish a manufacturing facility in Jefferson City. The company, a designer and manufacturer of specialty vehicles and vehicle bodies, plans to create more than 300 jobs in Jefferson County over the next three years. The approximately 500,000-square-foot facility is expected to be operational in 2019. Global manufacturer and distributor of residential and commercial outdoor power equipment MTD Consumer Group Inc will invest $10 million in its Martin operations over the next five years. The company plans to create 200 jobs in Weakley County as it adds production at the Martin facility. Texas Steel Conversion acquired the business assets of Superior Drillpipe Manufacturing, Inc. based in Houston, Texas to expand its line of products. Piping and Equipment, Inc., a subsidiary of Fairmont Supply Company, is a full-line industrial distributor of pipe, valves and fittings, has expanded its business by opening a Houston North branch location. The new facility, in Houston, is home to its corporate office and includes a warehouse. Auxiliary Systems Inc., an auxiliary system manufacturer for commercial and government clients in the marine industry, will invest $220,000 to upgrade its water jet cutting machine in the City of Norfolk. Sixty-five of the company’s existing employees will be retrained to operate the new machinery with support from the Virginia Jobs Investment Program (VJIP). IMS Gear, a German-based manufacturer of automotive equipment, will invest $1.05 million to upgrade its CNC cutting machine in the City of Virginia Beach. The company’s 115 existing employees will be retrained to operate the new machinery with support from the Virginia Jobs Investment Program. Blue Ridge Optics, a specialist in the fabrication, polishing and coating of optical components, will invest $750,000 to develop a new product line in the Town of Bedford in Bedford County, Virginia. The company will receive funding from the Virginia Jobs Investment Program to support the retraining of seven existing employees on the new equipment. Aurora Flight Sciences, a pioneer in unmanned aircraft and autonomous flight, will invest more than $13.75 million to expand its operation in the City of Manassas. The company, which was acquired by The Boeing Company in 2017 and is headquartered in Manassas, plans to build a robotics and integration facility that will consist of a manufacturing unit, a research and development lab, a hangar, and office space. The project will create 135 new jobs. Cascades Inc., a Canadian leader in the recovery and manufacturing of green packaging and paper tissue products, will invest $275 million to establish a lightweight recycled containerboard operation in the former Bear Island Paper Mill in Hanover County. The project will create 140 new jobs.